The winning fifth-graders in the WFD reading contest are, from left in the front, Trever Shultz, Joslynn Cook and Kiara Cook. From left in the back are Wilmington Fire Chief Andy Mason, East End Elementary Principal Jen Martin, and Wilmington firefighters Jack Coates, Jeff Haines, Rick Birt and Brent Terrell. Before hopping into the fire truck and going to lunch at a local restaurant, WFD firefighters passed out fire department T-shirts and certificates to the winners of a reading competition among East End Elementary fifth-grade students. From left are firefighter Jack Coates, winning students Joslynn Cook, Kiara Cook and Trever Shultz, and firefighter Brent Terrell. WILMINGTON — In an effort to encourage youth to build the vital life skill of reading, the Wilmington Fire Department has teamed up with Wilmington City Schools’ East End Elementary staff to sponsor a reading program “Blazing a Trail to Reading”. 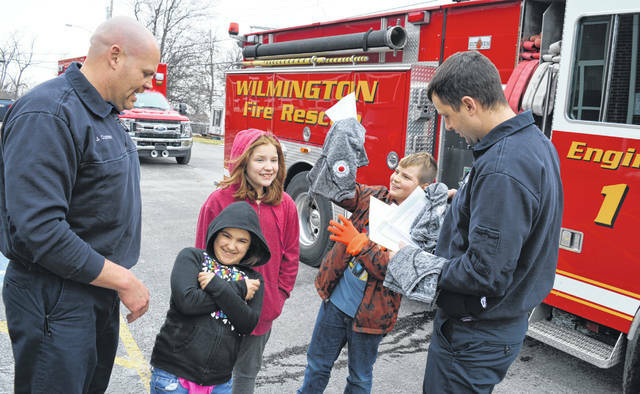 Firefighters met with the Wilmington school district’s fifth-grade students to stress the importance of literacy in their lives. Firefighters also encouraged students to take part in a 10-week competition to see who could read the most hours. The top three students were awarded a Wilmington Fire Department T-shirt, a certificate and a lunch compliments of the Wilmington Professional Firefighters Local 3011 union. 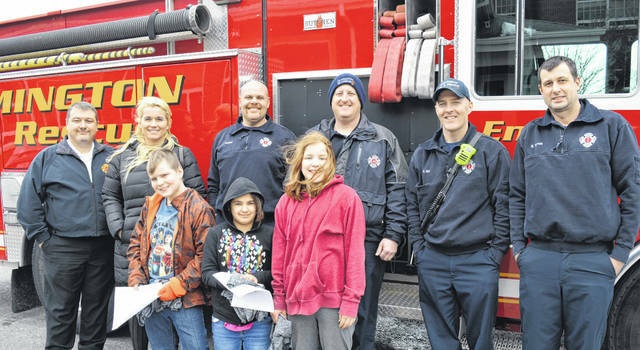 The winning students and East End Elementary Principal Jen Martin were picked up at the school building and taken to lunch at a local restaurant in a City of Wilmington fire engine. The Wilmington Fire Department stated it would like to congratulate these three competition winners: Kiara Cook, Joslynn Cook and Trever Shultz. All three of them read more than 80 hours during the competition. The WFD wants to thank all fifth-grade students, the East End Elementary School staff, and the City of Wilmington administration for participating in the program, and for helping to make the inaugural “Blazing a Trail to Reading” a success.